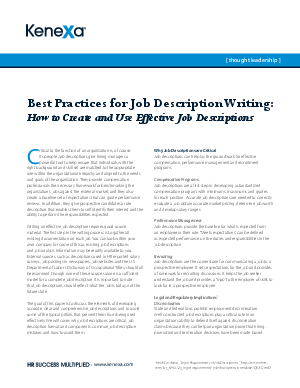 This white paper examines the importance of accurately written job descriptions and their effect on an organization. Job descriptions not only describe a job but they also expedite the hiring process, help the market pricing process; assist in defining organizational structure; play a role in an organization's ability to defend itself against discrimination claims and can serve as the foundation for compensation, recruiting and performance management programs. The job description writing exercise should be a collaborative process, requiring input from human resources, job incumbents, team members, managers and legal. The effectiveness, usefulness and legality of the description are directly impacted by these contributors.